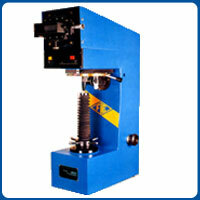 Testing range is very wide, from soft metal such as lead, upto the hardest, like hardened steel. 1. Standard Text Block - 1 Pc. 2. Diamond Penetrator - 1 Pc. 4. Flat anvil - 1 Pc. 7. Electronic Cord - 1 Pc.